Guide in 'Crafting & Gathering' published by romanosovsky, Dec 18, 2015. In this guide, I will write about the use of certain new crafting skills in Heavensward, along with an experiment on the Good rate during crafting process. Hopefully this guide will bring new ideas besides Caimie's great crafting Guide. Byregot's brow is a mini-byregot learned at lv51. As a finishing move, it can only be used under Good or Excellent condition, but weaker than Byregot's Blessing when IQ stack is high. It's pretty much useless in manual production, for Blessing is always available and gives better quality. You'll never need it on your hotbar. However, it can fit well into macros - let macros "bait" for Good conditions before a proper Blessing, just like manual crafting. Byregot's Brow automatically checks for Good by its nature: when there is no Good, nothing happens (except for an error message), and the macro can continue to buff the final move; when Good occurs, it will work, overriding remaining steps and Blessing. Although Brow is weaker than Blessing, a Brow on Good condition is still better than a fully-buffed Blessing on Normal. Literally, [ Great Strides + Brow (Good) ] is roughly better than [ Great Strides + Innovation + Ingenuity II + Blessing (Normal) ]. The old Byregot's blessing in macros are fixed: it cannot take advantage of Good, and when it unluckily lands on Bad, it usually means NQ. With Brow inserted, it will never land on Bad again, for if there is an Excellent, the Brows will surely take it. In this way, the macro can work more intelligently with Byregot's Brow. Note that its success rate is only 70%, thus needs to be protected by SH II, which costs 3cp more. ps: My advice is (in macros) to use as many Brows as possible to bait for Good before the Blessing, that is, [Great Strides - Brow - Innovation - Brow - CS II - Blessing] is quite acceptable. Although the last Brow is never better than Blessing ( put at the same spot ), this macro may try its best to catch a Good. This is because the RATE OF GOOD CONDITION is HALVED in lvl 60 recipes. So, what's this Whistle all about? Spending 36cp and nothing happens? The Whistle system includes several abilities that depend heavily on RNG, and is very unpredictable. But here we should first put the random issues aside, and look at the big picture. In fact, the Whistle/Wheel combo can be a viable substitution to Waste Not. Mostly, the W stack is between 4-8 (why? see below). As a result, Whistle + Wheel can get 2 steps with 54cp, quite like Waste Not (56cp, 2 more steps). Whistle, however, is more flexible and cp-saving than WN. You can take the Wheel freely (as long as you have W stacks at 4-8), while WN is quite fixed. Meanwhile, on the way towards W4-8 you will go through W9, where you can take Satisfaction to get 15cp. So actually this combo will take (36-15+18=)39cp for 2 steps. Therefore, when you plan to use Whistle, your main goal is: try to reach W4-8, then use Wheel and get 2 extra steps with (54-15)cp. Other repair skills can change accordingly: when you use Waste Not II or Manipulation, use Waste Not instead, so you can get the same amount of steps with less cp, or get more steps. Now we need to come back to the damned RNG issue. To reach W8, we need at least 2 Goods, for with 2 Goods passed, we get W9, then by taking a Satisfaction we can surely reach W8. Unfortunately, the RATE OF GOOD CONDITION is significantly reduced in ~lvl 60 recipes. As a result, We may never get to W1-3 with a difficult recipe, and this is why the W stack will likely end up in 4-8. In fact, the chance to get >=2 Goods in ~25 steps is only 90% (damned). When the W stacks stays at 11-10 (annoying! ), we cannot get any extra cp, while the Whistle has already eaten 36cp! So, what if everything goes south? The Heart of the Crafter may save you. Take it and all the above rotations will come back to work. Pay cp, blue scrips, gil, and all your fragile heart for a few Goods - is it worth it? In my opinion it is totally worthy, given the reduced base Good rate. I used it for a few times, and it gave me 3-4 Goods in a row. The key point is how to plan these Goods. My choice is: first, take 2 Tricks to reclaim the cp; then use the remaining steps to land the Byregot. Because you'll likely get Good every other step, the rotation is rather fixed. Anyway, the key point is: don't panic; take 2 Tricks to reclaim cp; put buffs between Goods to enhance Byregot. The best point to activate this ability seems like this: about 100cp left, Steady Hand just ends, or has 2 steps left before this ability. And durability should be quite enough for 1 touch, Byregot and remaining progress. You may even try to use Trick after Great S, hoping that the last round of Great S is still Good. More tests are still needed. Because the baseline Good rate is low, the total extra cp / extra number of steps is quite limited. It is quite common to get IQ8-9 after all hasty/precise touches, and the remaining cp is just enough for completion. It is also very hard (less than 40% chance) for Good to occur within one Great S with baseline rates. So if you are crafting something very expensive and HQ is a must (e.g. ilv170 crafting gears), the Heart will definitely worth its price. Currently the Chinese servers are in version 3.01 (may update to 3.05 after Christmas). During my leveling from 50 to 60, I felt that the Good rate had been lower than before, while others felt the same. Finally I did some experiments, and estimated the Good rate. I found that Good rate differs by recipe level, and the RATE OF GOOD CONDITION is HALVED in rlv ~58 recipes. 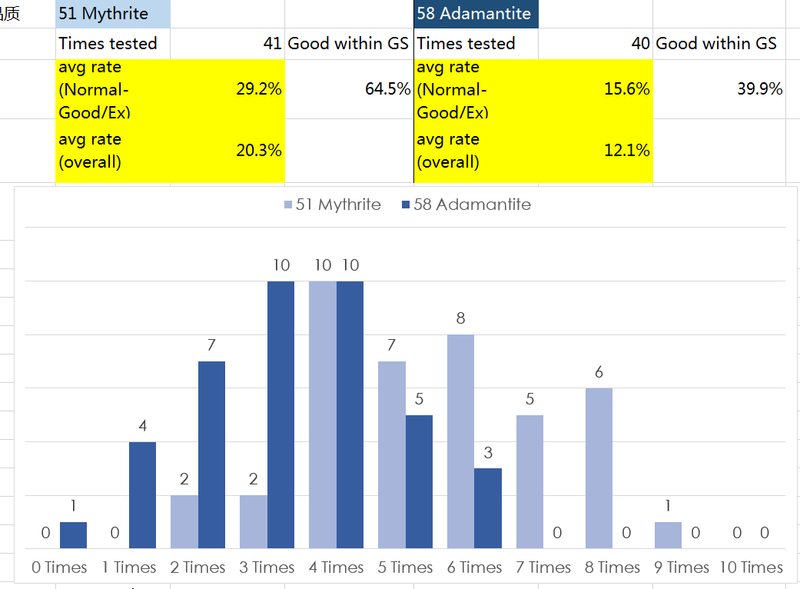 I use rlv51 Mythrite Nugget and rlv58 Adamantite Nugget respectively. The job is lv60 Expert BSM, with 721 crafting, 656 control and 396cp. First, take the Whistle (36cp). W stack decreases by 1 for each Good/Excellent, so I can easily count by looking at the final W stack. Then, use all the remaining 360cp to Observe 25 steps (macro), and check the final W stack. The number of Good times is thus (11-W). The results are very clear. Higher level recipes give far less Good than lower ones. It's a 40%-50% cut. The lowered rate means that the extra cp/steps one may get during crafting process are very limited. We have to rely more on starting cp, and every Good is more valuable. If you miss a Good and press hasty/buff/progress, you are unlikely to get another very soon. Moreover, it is also very hard (40% chance) for Good to occur within one Great S with baseline rates.